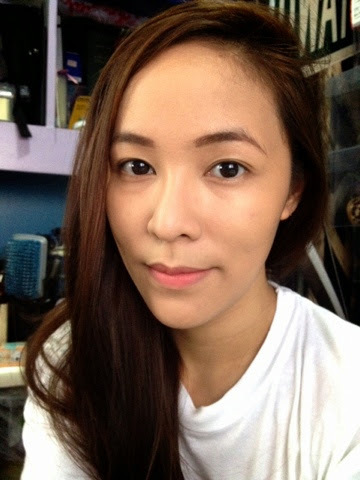 Beauty Budget Series: San San Matte Finish Liquid Foundation and Pressed Powder | Vanity and Everything in Between. 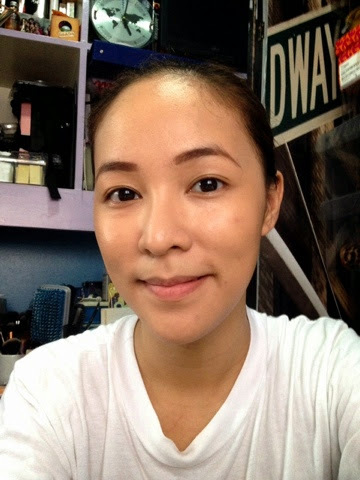 I used to get a lot of questions from people if I use makeup brands from the Philippines. The answer is yes and I don't know why it doesn't seem to be convincing every time I answer the question. Using imported brands of makeup is now a preference because I've had my fair share of hits and misses when I was building my makeup collection. More than half of my makeup case consisted of local brands. I just never got to blog about those products because they were all misses. Moving on, I came back to my senses and decided to give local brands another shot. After all, I'm currently settled here in Manila. A lot of bloggers have raved about San San and how it's a good brand despite being a local brand. It took me years to try this brand because I didn't know where to buy the products and I just wasn't sold enough to try the brand. But one afternoon changed it all when I had all the time in the world at a random mall and there was an HBC Store where San San products are available. When I got inside the store, I immediately went all the way to the back to check on their makeup selection. Truth be told, it's pretty impressive as it seems to have everything. San San even has an age defying line of makeup. First thing I picked up was the matte foundation because I've read several reviews about this and 9 out 10 reviews were positive. I suppose it's gotta be that good, right? San San Matte Finish Foundation comes in 4 shades. Some may find that the range of shades isn't enough. 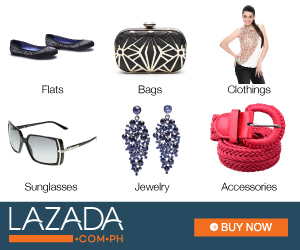 But I think the shades can suit most Filipinas. I had a hard time with #1 and #2 though since they look the same to me. The name of the foundation comes in number instead of shade names. 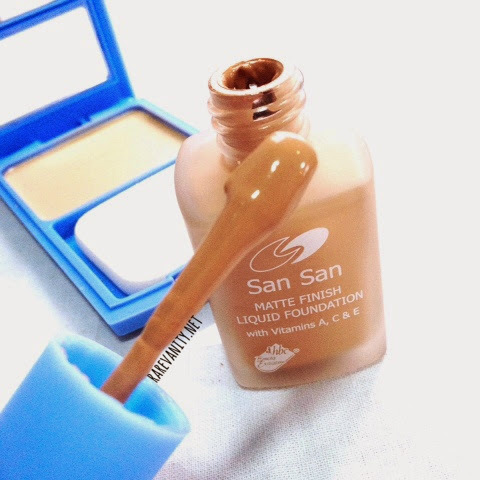 For a 30mL liquid foundation, I find San San's foundation to be smaller than other liquid foundations that also has 30mL. It comes in a glass bottle though which is impressive as it lessens its look of being cheap. It doesn't look cheap at all, actually. The deal breaker though is the attached spatula on the cap of the foundation. When I opened the foundation and saw the spatula, I was like, SRSLY?! SRSLY. Well, yes, seriously. Sure, the spatula has its perks for being included in the cap but I prefer not to have it sticking in the cap because it can be the start of all things unhygienic. It would have been better if the foundation came with a pump or if it can be bought separately. If you have a mixing palette, make sure to always transfer the foundation to the palette. Never apply foundation using the spatula and then dipping it back to the foundation to get some more. Never do that. Double dipping = bacteria! TIP: You can use a blank CD as a mixing palette instead of shelling out at least PhP500 for it. 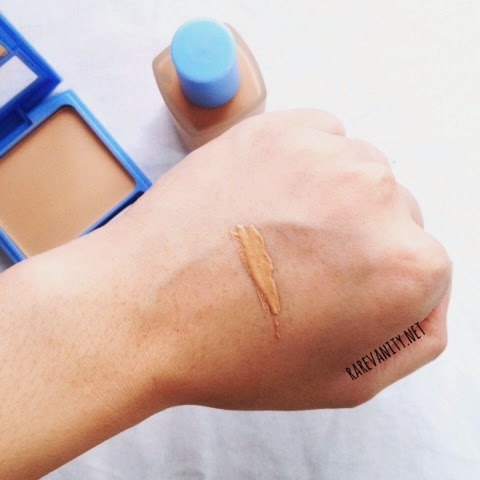 Here's a swatch of the foundation. I got the shade #03. It is 2-3 shades darker than my skin tone. I chose a darker shade because it has SPF15 and I pre-empted the idea of this foundation oxidising on my face making it as white as snow during flash photography. I'm not sure if you can tell from the photo but the foundation has a very thick consistency. It doesn't turn cakey but its thickness bothers me a bit. I don't know if it's just me but the foundation smells like chocolate! As for the pressed powder, I got the shade #04. I wanted to get #03 as well as I assumed it's the same shade with the matte foundation. But when I checked the shades side by side, the pressed powder in #03 was way darker than the matte foundation. I informed the sales lady about it since it might just be an error but the slew lady confirmed that #03 pressed powder is darker. I find it weird until now. Anyway, I got a lighter shade for the powder as my foundation is already dark. Below is a swatch that was badly taken. Mr. Sun was so generous in giving sunlight when I was doing product shots. Meh. The pressed powder doesn't and won't give full coverage. You really have to use another product (foundation, concealer, etc.) to even out your skin tone as the pressed powder won't be able to even out and/or cover blemishes. The pressed powder reminds me of Revlon as they have a similar packaging. It comes with a square sponge that can be used to set the foundation or for retouch. I prefer to use a powder brush though. On a side note, the powder smells good! 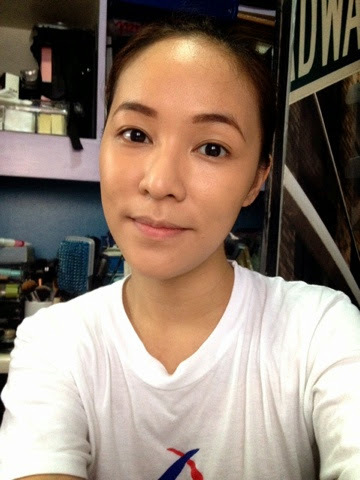 Here's a photo with 1 layer of the matte foundation without the setting powder. My blemish and eyebags were not completely covered. Here's another photo after two layers. The blemish was finally covered and my face looks more matte as compared to the photo above. Methinks the foundation has already oxidised thus my face doesn't look too dark. You can still see a bit of shade mismatch though. Look closely. The last photo is the matte foundation set with the pressed powder. Although it looks more natural now, I think I buffed it too much that my blemish on the cheek appeared again. Nonetheless, my face looks fresh yet matte! I love how this foundation and pressed powder look on my face for the first few hours of wear. On me, it stays matte for 3 hours; 4 hours max. My T-zone starts to oil up on the 4th hour. Because of that, I can sometimes see product build up on the sides of my nose. Annoying. It's probably due to the fact that the consistency of the foundation is very thick. 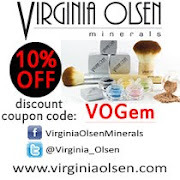 The foundation and powder contain vitamins A,C, and E and paraben! I didn't break out from using this product though despite its paraben content so, yey! It has SPF15 so be conscious about taking photos with flash! I can see why other bloggers love the foundation and powder. I love how it looks on my face. It can give me that flawless look in an instant for a very affordable price! One great thing that holds me back from always using these products though is its longevity. The foundation is not very matte. It's a bit dewy actually. The powder doesn't keep the oil at bay so I have to retouch or use blotting paper during lunch time. The product build up turns me off, too, although this is caused by my oily T-zone. But still. I'm trying to figure out a cure to my very oily T-zone as it wasn't as oily as it is now. By then, I'll try to use this foundation and powder frequently and maybe I'll get better results. 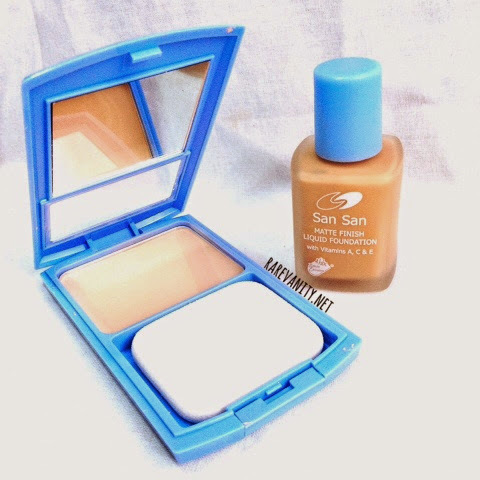 San San Matte Finish Foundation retails for PhP132.00 while San San Pressed Powder retails for PhP91.00 only. San San products are available at HBC Stores nationwide. 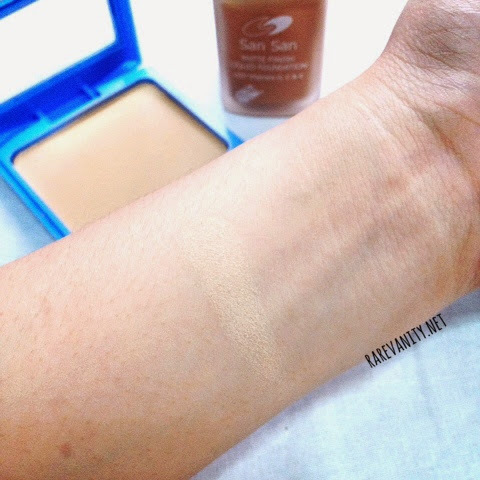 Let me know if you have tried this foundation or any San San products! I'd love to know! Maybe ako lang ang ganito,When using foundation i feel ang kapal ng face ko and i don't like when it dries maybe sa brand lang?Don't know,Ive tried Maybelline pero di ko gusto kaya pressed powder lang ako.Speaking of Spatula,Tinapon ko din yung spatula ng Belo face and neck Cream yung sa kojic.Messy gamitin.